Picture and info about the rumored bead have emerged. 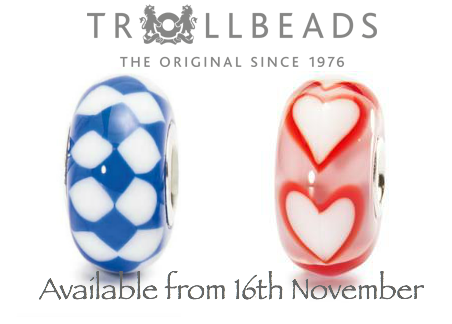 The new glass bead "Asian Hearts" will join the "Bavarian" in a series of universal core Country Beads. "Peace and unity is a common desire of Asian people, in all Asian flags red or white is present. Just like in the hearts of this bead". Asian Hearts is available from mid November. UU or standard core ? UU... like the Bavarian bead. I just wonder how many of those Country Beads will appear, and are they available only in asian countries? I like the hearts much better than the Bavarian bead, which I didn´t buy despite the fact that I lived in Bavaria for more than 40 years. But why UU ??? I'm not sure on the colours, but I like the design. Perhaps this would look good with the retired pink/red prism? I really like the designs of both beads, but.. I have looked at the Bavaria in different shops and haven't purchased because I just don't like the UU core. I have a few UUs, and find myself trying to use them in ways that disguise the big core, on pendants with a screw that covers the hole, for example. I don't know if I want to spend more on beads when I feel the way that I can use them is so limited. Such a shame. Seems there's no conclusive info on the core size. We figured two different sizes "country beads" would be rather odd. Awaiting confirmation. I like it very much! Hope that it will be easy to procure. I haven't made my mind up about UUs. I do not mind the UU because I can use them on other brands. I love the pandora dark silver bracelet. Also they can be used on thicker chains.. I really hate the UU but I have also an empowerment bead with the UU core and I love it too much to sell. I do not know if I want to buy this bead. Really love the hearts and design. I actually dreamt about this bead last night! It is actually very representative of "cuteness" in Asia and I think it will fit nicely on my Japan bracelet. I'm going to add it to my list. Like Fee, I have a few of the Empowerment beads and an OOAK that is just super lovely, so apparently I can live with the UUs! I can live with the UUs, I have many artisan beads that have the larger cores. And I completely understand Trollbeads doing it, why limit the sale of your beads to only those who have a Trollbead chain? All the other beads will fit on the Trollbead chain, which I am sure helps their sales. If the other beads did not fit on the Troll chain, I don't think I would buy them at all! @Catsworld wrote: I just wonder how many of those Country Beads will appear, and are they available only in asian countries? I doubt that Catsworld, haven't seen them when I was there, most shops only sell Pandora. But, although it is a UU core, it is a lovely design. I am excited to get one, the Universal core has not bothered me once I got used to it. I think I'll probably put 1 or 2 away for gifts as well. When was the release date? the cores of the UU Malawi are only minimal bigger than the normal cores, I am no longer completely against them, especially as there are some beautiful designs, and if I would buy let's say an Evolve bead then I have big cores as well, so why not allow TB to have larger cores? But that is only my opinion and I understand people who are against them.. I am no longer a TB-Purist, so it doesn't bother me any longer. I don't mind the UU core. However I am not so keen on hearts. I not keen on it, but I keep looking at it and thinking "when it is gone I will wish I had one." @LisaB wrote: I not keen on it, but I keep looking at it and thinking "when it is gone I will wish I had one." That is usually what I end up doing too!